For the rage moves we have an indicator that builds up rage over time as you are destroying more and more zombies. We needed a graphic that made it look like the player reached its limit. We thought a bar that builds up would mess up the current design and it was too plain. Other option was to make the player have something above its head saying you’ve raged. The game is getting busy with indicators and buttons to pickup things and thought this would clutter the game even more, making it harder to see where you were. The indicator needed to be in your stats. I created a circle that built up behind the player. Like building up rage then added static flame image to indicate when it had reached its limit. Like the animal has become so enraged heating up ready to release its fire. 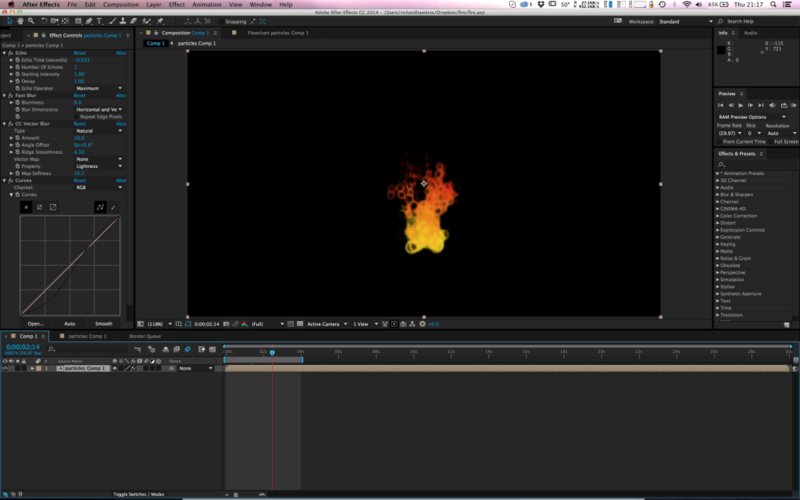 I created an flame animation using after effects particle system. To do this you need to layer different effects. Start with CC particle world to a composition and then tweak setting. Change the animation type to fire, particle type to bubble, (seems to work well for me), the birthrate, longevity, velocity, and gravity untill it looks close to the right movement. Then to make it look more like fire add motion blur. Create a new comp out of the particles layer. Then add an echo effect to bring it out effect. Add a fast blur, a vector blur tweaking the blurriness and amount. Then add curves effect mess with the curve of the alpha. Tweaking is the main thing with fire you can get different types of fire by just changing a few settings. Last I export an image sequence, create a sprite sheet and import into unity.